Reaper Miniatures’ Bones line (the amazing Kickstarter success of which you’ve already probably read about) operates on a simple concept: take some of Reaper’s popular sculpts, have them cast in vinyl – or “bendy plastic” as it’s commonly known – and sell it for a very low price. 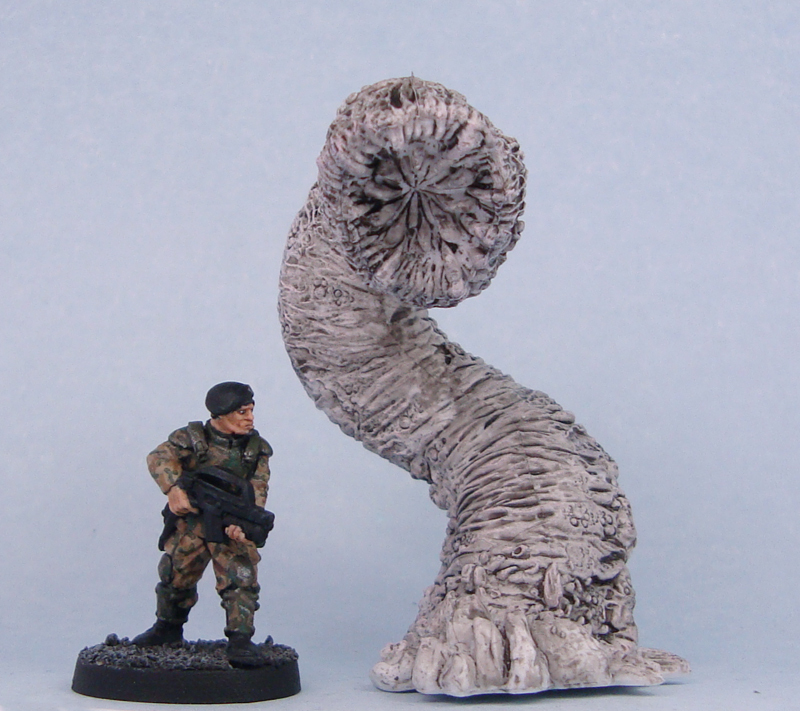 In this review I take a look at my first Bones miniature – a purple worm. The purple worm is a pretty iconic D&D monster. There’s something innately appealing and terrifying about a massive worm with a mouthful of big pointy teeth bursting out of the ground to nom on whatever it wishes. Just watch Tremors and you’ll know what I mean. Reaper’s purple worm, sculpted by Michael Brower, is a pretty impressive model. At its highest point it’s almost 70mm tall, making it tower over regular 28mm minis. The mouth is approximately 20mm in diameter, meaning that the worm actually looks capable of devouring smaller creatures whole. The worm is dynamically posed, as it coils up from the ground. It stands on an integral scenic base – basically a pile of rocks showing the worm burrowing out of the ground. The model is quite sturdy on the integral base. The prominent questions in my mind about the Bones range were about the material. I was somewhat suspicious about the bendiness, as well as the material’s capability of holding detail. I’m happy to say that in the case of the purple worm, I was positively surprised by both aspects. The bendiness of the material is there, but its effect is minimal due to the size and thickness of the worm. On thinner parts, like weapon hafts and the like, I can imagine the bendiness bothering me, but with the Purple worm it’s not an issue. As for the detail, while there is loss (I haven’t seen the original metal version apart from pictures), there is plenty of detail and texture on the model. It’s not comparable to metal or resin in terms of sharpness, but the overall effect is still good. 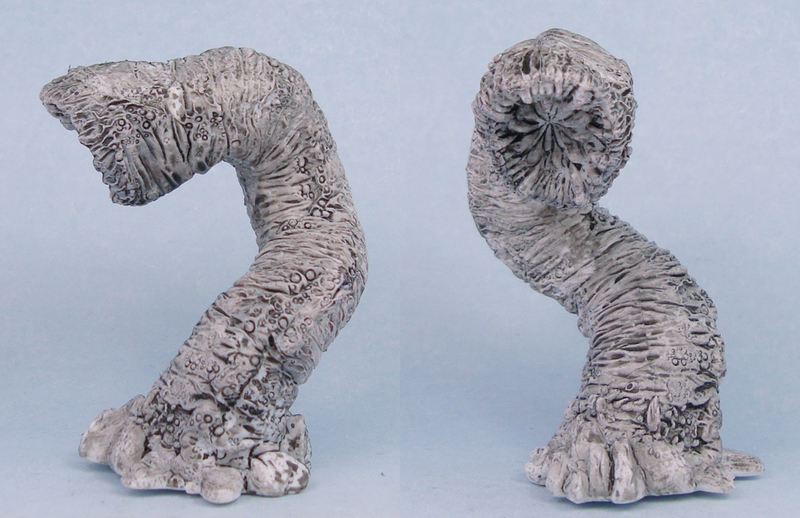 …and after a quick black wash and white drybrush to bring out the detail. The huge selling point of the Bones range is the price. Just to illustrate: the metal version of the purple worm (with visibly better detail) is listed on the Reaper website at $27.15. 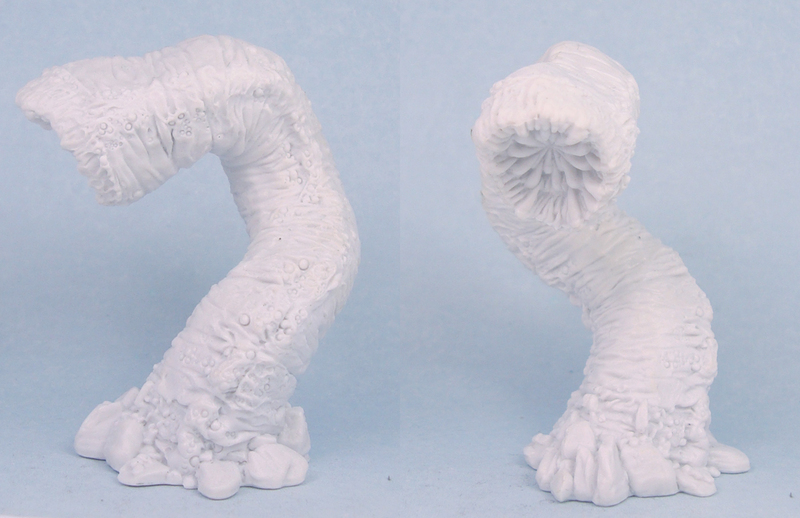 The same plastic model is also available as the pre-painted “great worm” for $6.99. The Bones version retails for $2.99 – a measly 11% of the price of the metal original. While some people will prefer the superior detail and heft of the metal model, that’s a massive price difference (I should know, having ordered eight of the Bones one). For a model of this size, $2.99 is a bargain. This size? Below is a size comparison with an em4 trooper. EDIT September 19th 2012: It has been pointed out to me by two commenters (see comments below), that there isn’t a lot of difference in the level of detail between the Bones version and the metal version of the worm. Overall verdict: The Bones purple worm is a great example of what the Bones range can deliver. A large model for a very low price, with a reasonable level of detail and minimal bendiness issues. If you’re looking for something like this – a giant killer worm, that is – and don’t want to spend loads and loads of money, then look no further. While it’s not (EDIT Sep 19th 2012: or is it? see my note above) metal or resin when it comes to detail, in this case it’s more than sufficient. The nature of the creature means it can be used in a variety of settings. It could easily be a Lovecraftian beast, something roaming the post-apocalyptic irradiated wasteland, a vicious alien creature on a far off planet, or…well, a purple worm in fantasy gaming. You can get the purple worm directly from Reaper, or from various retailers. At the time of writing, the model retails for $2.99. Thanks for the review Mikko! The worm looks nicely detailed. Do you plan on adding more colors? It’s good to hear the soft plastic is decent. I pledged on the Reaper Bones kickstarter campaign, so I’ll have their fantasy minis to paint for the rest of my life… Lots of smaller figures in that kickstarter campaign, so I’m just hoping they’ll be enjoyable to paint as well. Does the bendy plastic resemble the plastic of the Last Night On Earth miniatures? Thanks for the comment Tobbe! Definitely looking to actually paint the models, just put the wash on to bring out detail. Can’t comment on the LNOE minis, as I’ve never held them, unfortunately! The only thing that bothers me is your assumptions on detail. I own both the original and Bones version of the model ( I did this before getting involved with the Kickstarter). What surprised me is that there wasn’t a loss of detail between the two mediums. The only challenge I found was that thinner parts may e bent and have to be straightened with heat (hot water will do the trick). The bonus to the “bendiness” is that the model doesn’t tend to break or chip when dropped or handled by little kids too roughly. The other aspect that sold me on the line is the lack of need to prime or wash the mini – you can paint it out of the blister (I did find that some of the orcs needed some mold lines cleaned up). Thanks for the comment! I have to thank you especially for the heads up on the detail issues – since I’m only working with photos on the metal one. I’ll add this to the review! I finished painting this one and it was great to work with. I notice little detail issues in comparison to the metal version and the ‘bendy factor’ is very low. Not so much the case with some of the others in the Bones line, particularly the Ghost and Werewolf. The material shows it’s weakness with those two. The Dwarf Warrior and Ogre Chieftain have been fun to paint as well. by the way, how do you stage your minis for photographing? How, exactly, did you wash the miniature? I’m guessing you didn’t use the usual water + paint, since that would bead on the plastic. Thanks!!! Thanks for the comment! If I remember correctly, I used a wash (GW’s Badab Black, probably) straight from the pot. The model did need a few coats in some areas, but overall it was easy work.